Israel has launched air raids in Gaza and deployed tanks and infantry across the border after it vowed a severe response to rocket attacks on its soil. It said its land force was small and had been deployed as a deterrent. At least three militants were killed in four separate air raids, one of which targeted Hamas offices in Gaza City. The Israeli attacks came as fighting eased between Palestinian factions Hamas and Fatah. It has left at least 40 people dead in the past five days. Correspondents say the rocket attacks into Israel appeared to be an attempt to draw it into an internal Palestinian conflict, although the Israeli defence ministry denied its attacks were linked to factional fighting. Palestinian Authority President Mahmoud Abbas, who leads Fatah, on Thursday suddenly called off a trip to Gaza that had been billed as an effort to shore up the fourth Hamas-Fatah ceasefire in five days. Officials said he might now travel from Ramallah in the West Bank on Friday. The BBC's Magdi Abdelhadi says control of the security forces appears to have been the trigger for the latest factional fighting but that it has now developed a momentum of its own. Armed supporters on the ground may no longer be paying attention to orders from their political leadership, he says. On Thursday in Washington, US President George W Bush said both he and visiting UK Prime Minister Tony Blair were urging all parties to work for peace. Israel has deployed artillery batteries on the Gaza border to support the tank and infantry units. A military spokesman said the force was on a "defensive operation". The move came after Hamas militants fired more rockets at the southern Israeli town of Sderot. The BBC's Middle East correspondent Tim Franks, who is in Sderot, said many people there were demanding the Israeli military take robust action inside Gaza. 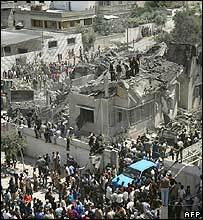 Israel withdrew from the Gaza Strip in 2005. The military earlier confirmed four air strikes in Gaza. One destroyed the second floor of a two-storey building belonging to the Executive Force, a militia force with the task of maintaining security in Gaza. Hamas's armed wing threatened to renew suicide bombings in Israel after the strike. The second air attack targeted a car carrying militants in Gaza City, Israel's military said. A Hamas official told Associated Press news agency one senior commander was killed and another wounded. One Hamas militant was killed in the third attack - on a housing unit for security guards of a senior Hamas official. Israel said the fourth attack targeted a rocket squad near the southern town of Rafah but Palestinian sources said a father and his two teenage sons were killed in a case of mistaken identity. On Thursday morning, factional gun battles broke out in the southern Gaza town of Rafah during a funeral march for a slain Hamas man. A pro-Fatah gunman was said to have been killed. However clashes were reported to be lighter overall. The fighting between Mr Abbas's Fatah and the Islamist Hamas threatens a hard-won unity government they formed in March. Information Minister Mustafa Barghouti - one of the Palestinian cabinet's independent members - described the violence as shameful.